Typical of California, San Diego is a city of freeways, spread out along stretches of magnificent Pacific beaches and chock-a-bloc with all sorts of attractions, which makes a holiday in sunny San Diego a series of seemingly endless adventures. The city's Spanish and Mexican roots add to its excitement, particularly downtown, which remains the tourist hub for those who travel to San Diego. San Diego offers everything from award-winning restaurants and fantastic shopping to historic and natural attractions. Do not hesitate to take the whole family when you travel to San Diego for the quintessential California experience as the city is very child-friendly. San Diego is a city for all seasons, so whenever you choose to take your San Diego holiday you will find something special to remember, whether it be the spring flowers, migrating whales, or autumn foliage cloaking the mountains. Weather-wise, all year round the city is blessed with sunny, mild days, so it is safe to plan to travel to San Diego at any time. Read more on San Diego's Climate and Weather. -Treat the kids to a day out at colourful Legoland California. -Meet the fluffier locals at San Diego Zoo, one of the most popular in the country. -Visit the California Surf Museum for an education in surf history and surf themed art. -Explore the many museums and art galleries of Balboa Park. -Visit the beaches and 'The Del' on Coronado Island. 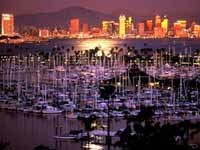 -Ramble, shop and eat out in downtown San Diego, including the historic Gaslamp District. -Climb Mount Soledad for wonderful city views. Although not as famous as Napa Valley, San Diego Wine Country produces some excellent wines and exploring the vineyards is a fun excursion. Those looking for something more frenetic and exciting can visit nearby Tijuana, the Mexican border city renowned for partying and gambling opportunities. For glorious desert scenery undertake the short drive to Joshua Tree National Park. San Diego Lindbergh Field Airport is said to be the third busiest single-runway airport in the world and is a popular Californian air hub. The airport is situated two miles (3km) northwest of San Diego. Get more information on Airports in San Diego. -None of the lakes in San Diego allow swimming. -The Whaley House, built in 1857, is the oldest brick building in southern California and is famously haunted. -The world's oldest operational ship, the 'Star of India', calls San Diego home. The ship has circumnavigated the globe 21 times. San Diego characterises a typical Southern Californian beach city: with year-round sunshine and surf, a superb coastline with miles of sandy-white beaches, easygoing inhabitants, and a wide variety of world-class family attractions, tourists can't help but be drawn to 'America's finest city'. Although California's second biggest city with an ever-increasing population of more than a million, San Diego prides itself on its small-town ambience, with very little of the pollution, highway congestion and raciness of Los Angeles. In 1769 a Spanish missionary by the name of Father Junipero Serra established a Catholic mission and fortified settlement in what was later to become San Diego; it was the first permanent European settlement on the West Coast of the United States. The city is a vibrant collection of colourful neighbourhoods and communities. It has award-winning restaurants, trendy shopping districts, attractions such as the world-renowned San Diego Zoo and SeaWorld, and a dynamic downtown district that includes the city's historic Gaslamp Quarter. There are numerous indications of its Mexican and Spanish heritage in the traditional architecture, typical Mexican cuisine, and strong links with the town of Tijuana just across the Mexican border. San Diego is also rich in art and culture, and the city boasts the largest urban cultural park in the US, with beautiful gardens and Spanish architecture featuring 17 museums, art galleries and theatres to be found in Balboa Park. More than 70 miles (113km) of beaches around the city offer superb surfing and beach activities and provide the perfect introduction to this accessible and laid-back city.